SkySafari 6 Pro will revolutionize your astronomical viewing experience on android. SkySafari has the pro and largest database of any astronomy app, includes every solar system object ever discovered, offers unparalleled accuracy, flawless telescope control, and provides the very best experience under the stars when you depend on it. 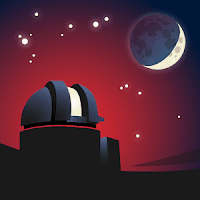 Discover why It is the #1 recommended astronomy app for serious amateur astronomers since 2009. Clouds and Astronomy. Two words that rarely go together. SkySafari will (optionally) back up all of your observing data in our secure cloud storage and make it easily accessible to multiple devices as well as from our new web interface, LiveSky.com. We Have The Best Stars. Precise, modern and deep. We’ve updated our star catalog to use the latest and greatest, UCAC5 star catalog. If 25 million stars down to 15th magnitude isn’t enough for you, an easy in-app purchase gets you down to 16.5 magnitude and a whopping 100 million stars! We Have The Best Galaxies. The PGC catalog includes galaxies down to 18th magnitude. Want more galaxies? How about 2.6 million more? An in-app purchase gives you access to the largest galaxy database available for your device. Observers First. A redesign of our tools puts the active observer first. Quick access to features like your equipment, observing sites, lists, and observations make it easy and enjoyable to get out, observe, and record your observations. The observing sessions feature lets you collect your observations into groups that span a few hours, or a few nights. Graph It. The completely new graph tool will give a quick visual representation of an object’s altitude above the horizon. Essential for planning your night’s observations.